We have spent many, many hours pulling together a list of what we believe is every book ever published on Acceptance and Commitment Therapy (ACT), by any publisher. We hope that in navigating this site, you can quickly find books that are helpful for you, whether you are a member of the public looking for a self-help book or a professional looking for information about how to use the therapy. If you know of an ACT book that’s not on this list, please fill out this form so we can keep this list as comprehensive as possible. We try to update the list on an annual basis, so it should contain pretty much every ACT book ever written. 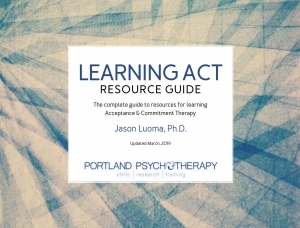 This list is excerpted from the Learning ACT Resource Guide, a companion to Learning ACT (2nd Edition), a free guide that includes the following resources: a learning action plan worksheet, a core competency self-rating form, and a comprehensive list of ACT books categorized by population and setting.